Welcome To Day 11 Of Baking With Pumpkin! Last night was the Navy Ball. I was looking forward to it, then I also was not. I often feel like these types of events are so stuffy and hot and normally kind of dull. Thankfully last night was nothing like last year. It was an amazing time all around. Had so much fun..maybe a little too much fun. I am also pretty sure I drank way too much Vodka & Whiskey! Today was a slow going day, more like a recovery day. I had a lot of fun with my husband dancing and laughing and with my friends. It was much needed. So let’s talk about pumpkin bread. The recipes out there are a dime a dozen and often you just either have to jump in and try one or use an old faithful, tried & true recipe. I have to say, I’ve been using whatever recipe my mother has for years. Once in a while I try a new recipe and almost all of them fell flat somewhere. Lacking this or that. 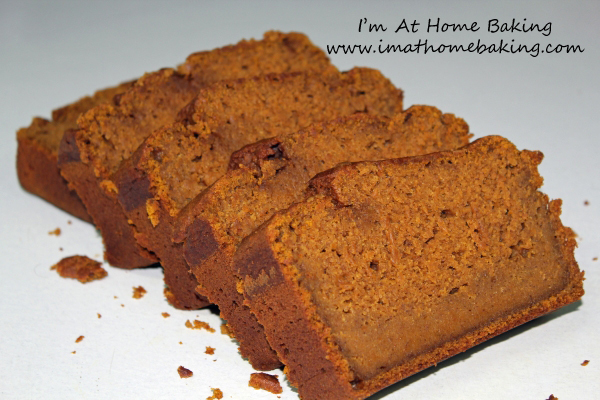 I have even tried a few yeast pumpkin breads and they were horrible,lol. Let’s now talk about Alton Brown. He is one of my very favorite people out there and I often seek out his recipes these days. I am usually pleased, especially when it comes to baking with his recipes. I was going to just bake my usual recipe and call it good but decided to change it up a bit and hope it did not fail. I did modify the recipe a bit. I thought there was not enough spices in the recipe and I decided to switch some of the white sugar to brown sugar. The recipe will show how I made it, with my changes. It really came out very delicious and I am happy. Sift the flour, cinnamon, baking soda, baking powder, salt, nutmeg, pumpkin pie spice together. Bake for about 1 hour and 15 minutes, maybe longer. At this point a knife inserted into the middle of the loaf should come out clean. Cool for 15 minutes and turn out onto a cooling rack. Cool completely. For muffins temperature should also be 325 degrees F., but bake for 30 minutes.